I loved+dreaded this back-to-school time of year. I was a “happy” child. 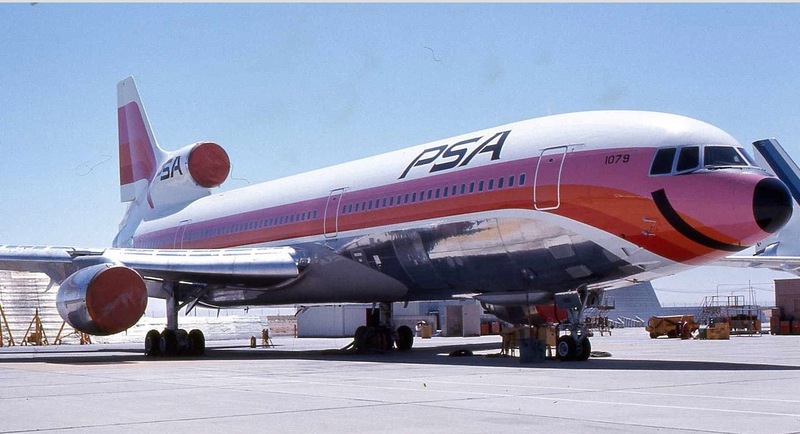 I was so smiley my classmates teased me by calling me “PSA” – because back then, planes from “Pacific Southwest Airlines,” PSA, had giant smiles painted on. The “wide body airplane” was implicit. Or maybe that was just my own insecurity. My grades were “fine,” I rarely was “in trouble.” I had enough to eat. So in many ways, my childhood was wonderful. Yet beneath the “ok” surface, I didn’t really feel ok. I didn’t really feel like I belonged. The smile was often genuine, other times, painted on. Frantically gathering food for the day as I rushed to be in time for the bus, stuffing my paper-bag lunch into my backpack. By mid-day, the yogurt would break open and soak into my homework & textbooks. Maybe this would be the year the yogurt stopped breaking? Desperately wishing I’d started my homework earlier. Loathing and self-loathing Sunday-night realization that I wasn’t prepared for Monday. Maybe this would be the year my homework would stay under control? Seeing my classmates laughing, connected, belonging – me an outsider looking in. Playing four-square at lunch, I’d be welcome to join, but rarely invited. Maybe this would be the year I’d have friends who wanted me? These stories are simplifications of a deeper fear, a deeper hope. A hope for renewal, for change, was tied to all of my worst fears (and maybe yours too? ): Will I fit in? Will I find my way through this maze? Will I be loved? Will I sit alone at lunch? Am I ok? I wonder if, beneath my smiling surface, my teachers had any idea how I felt? I wonder if they ever glimpsed my hopeless hope, my longing for this new year to remake me into someone who was good enough. I wonder if teachers reading this now might see more deeply into their new students. Could they gently understand the desperate longing that will soon fill the seats of their classrooms? If you’re a teacher, what do you want your students to feel in the first minutes… first hours… by the end of the first day? It’s possible that’s exactly what they’ll bring into the room. It’s likely they will also have other feelings. Which will rise to the surface? In large part that will be shaped by the classroom context you create. These examples sound sad to me, but I wasn’t usually sad. I was abundantly, overly, hopeful. I was a cheerful puppy bounding through the obstacles, not letting them get me down, but not changing. Is that optimism? In the Six Seconds Model, we describe the emotional intelligence competency as: Exercise Optimism. Wishes are beautiful, gossamer creations of dream and longing. Optimism has sweat on its brow. I didn’t have a plan, I didn’t take the ownership of the solution. I didn’t consciously, actively do the exercise that makes optimism flourish. Yet unbeknownst to me, time was working within me, and something unfolded. This unfolding is the great gift of my life. Somehow, miraculously, I found my way toward a self I am proud to be. But that came later. In my school-years, I had a wish, “somehow it would be different,” but no real intention to change. Now decades later, I’d like to go back and hug myself; gently, firmly I’d say: You have choices, and your choices will make your future. And while that’s absolutely true, I’m a bit surprised to realize: Determination is only part of the story. Optimism is ‘hope with a plan.’ It’s an exercise that takes work. Yet it also takes the space to unfold gently in its own time. Compassion helps as much as effort. I could hardly wait to start school to see if the long summer had transformed something in me, in us. I had this sense of discovery, of boldly going someplace new — and possibly wonderful. On one hand, it was nonsense, and each year led to inevitable disappointments and dashed hopes. My hastily thrown-together lunch inevitably spilled. My near-total lack of interest in the meaningless homework continued to accrue to a mountain of late slips. My earnest lack of attention to social acumen meant I remained a dork. But at the very same time I was right, year after year. Despite my inattention, time worked upon me. I love the quote, not because I wish for perfection, but because the singing water is a story of perfecting. Of growing. Of the gradual process of becoming. Reading this quote today, in light of my memory of the longing of my childhood self, my eyes fill with tears. I cry for the lonely kid wishing for a place. But perhaps even more, I cry in gratitude for finding one. For finding a new way to see myself as whole in my imperfection. There is, it seems, a magic in those slowly passing summer days. They are a dance of water. They are our parents telling us a million times to be better. They are the careful practice and the effortless reckless embracing of life. They are the power of trying again, and again, and again. The blossoming of possibility in the light of compassion. People often use phases such as, “drive change” — but maybe the most powerful change leads us? Maybe change isn’t something that is driven by force and control… maybe change is, in its deepest way, a process of unfolding. Maybe the forcefulness, the striving, is actually a barrier to change, and the real transformation comes from the warm summer afternoons that grow our interconnectedness? Of course, passing days isn’t enough. Time doesn’t teach us all we need to know. For me, the catalyst was finding a place where I fit. Of learning something about work that matters, something about participating in the world. Growing up: the gradual recognition that I have a part to play. Just one player on a vast stage, but a part uniquely mine. In my child-mind it would all happen by itself with the dawning of a new year. Later I thought I could simply make it be. Now, I glimpse that change is not linear correlation between work and commitment. There’s no “breakthrough moment,” no one point where step one becomes step two. The journey of growth is woven with chaos… and not done yet. It takes persistent work, but that’s not sufficient. For me, luck was a big help, but again, not enough. The real “dance of water” comes from all these, plus belonging, love, and, so powerfully the realization grows: I have a place. Yes, of course my choices determine if the yogurt explodes all over my backpack, but it’s more than that. Of course my choices determine if my homework is on time, but that doesn’t touch on the deeper why. Finding friends, and love, is closer. The real catalyst, the lever for change, grew slowly as I grew deeper connections with the world around me. As I grew to find passions, as I started my first business, as I fell in love, the span of my life enlarged. Finding meaning. Having children. Journeying. Learning to listen. The slow summer days turned into a gradual understanding: I am part of this story. Sure, it is one small part in a big cast, but I’m the only one who can fill this role, the world needs me to be me. Acceptance of this power and contentment with the small scope have taken time. I feel driven to make the world better, but I can only do MY work, I need to practice in my own life. In doing this work, I’ve come to feel less isolated (and the twin, a little less judgmental of self and others). As understanding of interconnectedness grew, my purpose became more clear. Finally I begin to see a new glimmer: My choices matter because my choices contribute to the dance of water for others. This truth still eludes me some days. Occasionally I still feel myself as outside the world, looking in. But much more often now, I feel that sense of meaningful connectedness for which I so desperately longed. It hasn’t come from “pursuing passion,” so much as growing passion. Deeper engagement leads to deeper connection. It’s sweat and tears and laughter, opportunity and wonder, gradual dawning of self- regard… patiently coalescing toward a life of meaning. This, for me, is the dance of water. The start of school is a miracle of raw potential, of infinite possibility. How will we use it? Now here we are again, back near the start of another year of school. Summer is fading, and it’s time to go back to class. If I could send myself a message back in time, what would I wish for? I don’t think I would have believed how my life would unfold, how I would unfold. While I’m sure it would still have taken time, maybe it could have been less lonely, less uncertain? I wish the teachers and parents and friends of my childhood could have seen a little more of the real me. That I could have had the skills to see that myself, to share that self a bit more. I imagine other kids like me going back to school in the next weeks, wondering: If they knew the real me, would they accept me? Would they love me? And I wish for them to find a resounding YES. I wish for them to see in the mirror of their teachers’ regard: They have a place. I wish for them to have the kinds of friendships where they know, no matter what, they belong. I wish for them to find in themselves the worthy person they are already. They feel the perfection of unfolding purpose. So here we are at the start of a new year, and I imagine all these children, and parents, and teachers wondering: Who will we be this year? Maybe it will be the same surface interactions, painted smiles, secret longing for a seat at the table. Yet maybe it will be different? Here we are in these days of raw potential — of renewal, of hope, of infinite possibility. As for me, now, long past days when September marked new books and school clothes, the echoes of this potential stayed with me. That feeling of please-don’t-let-summer-end blends with wonder and gratitude for what we can become, and I’m grateful. I wrote the first version of this article Sept 1, 2008 on 6seconds.org, then revised it Aug 2016, and again Aug 2018. What a great article, Josh! Thank you so much. I have written down so many quotes into my trusty little notebook of quotes — and not just Tagore’s quote, which is stunning. But also your words: “Optimism is hope with a plan…Optimism has sweat on its brow…Maybe change is a process of unfolding.” Beautiful. Thank you! Josh, I love this reflection and it resonates with me on so many levels. Last year as a teacher was not my best. I am hopeful for a new attitude and deeper insight. Reading your article unlocked something I can’t yet articulate. Thank you! I will especially share this with that special Teacher. My son came home that first day with hope. To boot, it was Sciences his worst subject. Yet that verbal, interactive affirmation in just 1 class kept him optimistic throughout. The slightest hope means so much. I will share this with our High School. Hi Sarah – yay! I hope there are more of those days than the other kind. It’s amazing how, when the clouds are dark and we can’t see the sky, just a little hope sustains us. Maybe it means that the harder things get, the more difference just a small effort will make. It is really true and I observe even in the graduate school, students are a bit anxious during the first day of school. Is the professor ok or not in terms of … (the qualities they consider acceptable). When the Professors give the course outline and timetable, usually the students would flip on the last page and browse on the course requirements. As professor/teacher, how can we motivate our students to love learning, particularly in the course we are teaching. What might happen in the next class? I know it’s incredibly difficult to accomplish this when students are enculturated to a transactional way of learning that’s all about checking boxes… but dare to dream? Nice article and and very inspiring words, Josh! This coming new year will be especially new for me since it will be the first time in my life I will be working as school counselor. This is something I finally got after years teaching Spanish. It is a totally new role, new responsbilities and duties but I am sure it will bring lot of great moments and a big challenge for me. I’ll keep you informed how it is going.